Spirituality: The Icing? Or the whole Cake? It was a great picture too often we view spirituality as a nice sideline or hobby, a bolt on, a leisure activity that can be squeezed into busy lives. And for some people that is how their Spirituality works for them, in the midst of a busy week, couple hours at Yoga, and then carry on with life as normal, living as we always had, except perhaps maybe slightly less stressed. Yet for the Christian, Spirituality isn’t just an activity we slot amongst the other stuff, it is the way we live our lives, all the time, day in and day out (24-7, 365 -what it means to be a living sacrifice, there on the altar of God by choice)..
Not just a drizzle of icing but the whole cake. This made me think about how we lead our lives as Christians. Perhaps we need to explore what it means that “he that is in us is greater than he that is in the world”, “Christ in us the hope of glory” and “treasure in Jars of clay”… A life where God is glorified in us, a life lived as life was intended to be lived by God is bound to be noticed, it will be like “stars shining in the darkness” unmissable like salt or light. I think there is something wonderfully missional about our lives being different from the world around us. We live in a world where people don’t know who they are, looking for authenticity, desperate to know what really matters in a materialistic and superficial world. St. Francis talked about our hearts being restless until we find our rest in him, and we see how restless our world is, especially in the west where everyone is so driven, hyped up on red-bull, but not actually sure where they are going, nor sure of the direction of their lives, but feel the pressure to go where-ever it is fast! Interestingly my friend Jonathan who used to lead a Church called B1 in Birmingham said he was often involved in coversations about wanting to lead a good life, the New Monastic Group Moot does life coaching, amazingly rich city types pay vast sums of money for someone to help them explore how to live their lives, because it clearly really matters to them. I am reminded of Freddie Mercury’s Song “Does anybody know what we are living for?” -Freddie Mercury was a deeply spiritual man, but never managed to get “a handle on life” describing himself as “desperately lonely”. We have this wonderful gift to give the world, but unfortunately it is also a gift that as Christians in the west we haven’t really fully opened, explored and enjoyed. Instead becoming like Chameleons trying to blend into the world around us, when really we were called to stand out, why will people listen to what we say, when they look at our lives and can’t see anything different from their own. I think of some of the wonderful wise (often elderly) saints I know, and I am really drawn to them, I find conversation with them incredibly inspiring. I think part of their appeal is that they have walked deeply with Christ and that is something deeply attractive. Too often we end up apologizing for what actually makes us beautiful and attractive to the world around us. Let’s be unashamed of the difference Christ makes to us in our lives, in the highs and in the lows, in the good times and the bad. Ironically, when we live our lives following Christ we become more the person we were created to be, more fully us. Bishop Lee cited Archbishop Rowan meeting Archbishop Tutu, and described him as a guy “enjoying being Demond Tutu”, this isn’t talking about pride or vanity, but rather being someone comfortable being themselves. We live so much of our lives worried about what others will think of us, and yet really what matters is the audience of one, Christ himself, what does he think of us? People talk a lot about mission, and a lot about discipleship, as though our sharing our faith and our everyday lives are somehow different, but I think the reality is who we are is what speaks volumes, and yet Churches we have worried to much about “saying the right thing” rather than “living the right way”. So, lets be people that embrace the cake, not just a frosting of spirituality icing. I have recently been thinking a lot about worship. I have suggested that those of us who regularly join together for Pints Of View ought to meet up and pray and worship first. Something I am keen to suggest too for us as Street and School Pastors before we go out. I think worship is the key to everything… yet when we worship because it is the key to everything we are missing the point, because to worship in order to get a key sounds more like playing Super Mario than living in a right relationship with God. I think when we come to God in worship, we are reminded of who he is, he greatness and might, and also of our dependence on him, so often in our meetings although he is acknowledged with a prayer at the beginning our focus often remains very much on ourselves and our capabilities. When we worship we focus on him and his abundance, provision and power. His faithfulness to do all that he has called us to do through us is liberating, because we need to be reminded afresh that we don’t do what we are called ‘for’ God but rather ‘with’ him. The less we worship the more we get this wrong. Worship is often an act of will, to be honest when life is tough, we are tired and stressed, often we squash our worship out of the agenda, yet often when we are feeling the least like worshipping, often it is when we need to worship the most. We discover that in worship there is a refreshing of the soul, a re-energizing of the will, a renewal of the mind that need, but don’t always need. Yet not only does worship reminded us of who God is, and not only does it require us to shuffle of the thrones of our own lives and let Christ re-take his rightful place, it also affirms us in who we are in Christ. We are his beloved children. I believe that because sometimes we live in worship poverty, that is a contributory factor in why so many Christians struggle with their identity in who they in Christ, and of the Fathers great love for them. Worship shows us God, but as we worship God somehow we discover afresh something of God’s love for us, a divine exchange seems to happen, as we pour our love at his feet, he pours his love over us. I’m struck by how we use our bodies in worship. When our hands our lifted up symbolise surrender, which is I believe at the heart of what worship is, even though we don’t understand what is happening around us, why it is happening, it is a surrender and saying to God even though I don’t understand, I still trust you with my life. When come before the communion table with our empty hands, we are reminded that we come to God empty handed, but come before a generous God who will provide all we need as we seek to follow him. When we are down on our knees we remember God’s might and majesty… his rule over our life, who he is, and us pledged to his service. Yet worship isn’t just a need for us, but I do believe that when we spend time in God’s presence we become more like him, we become like those we hang around with, which is true when we are with God, we become like him, he shines from us. I love the story of Moses coming down the mountain with his face shining because he had been in the presence of God, so much so he had to put a veil over his face… His encounter with God shone out to the people, who noticed the presence of God on Moses. It’s a picture often picked up in scripture, the treasure shining from the broken clay vessels, gleaming out of the cracks, proclaiming “Christ in us the hope of glory”. The presence of God with his people is so important and powerful that when God offers to let the people of Israel go into the promised land without him, Moses says “if you don’t go with us, how will we be different from the other nations of the world”. God’s presence is beautiful… he’s the one who draws people to himself, but gives us the privilege of partnering with himself. 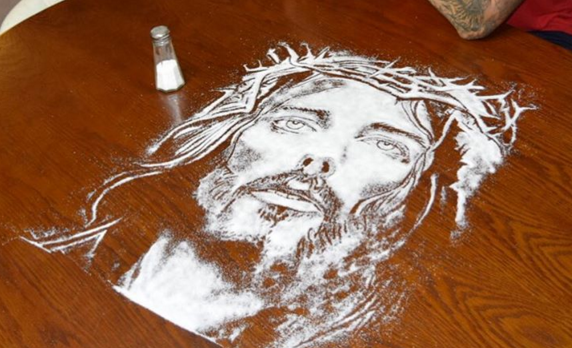 On twitter I came across a Catholic picture of the Communion Elements with the words above them “you are what you eat” -and although I’m not into transubstantiation- I love the picture, the more you celebrate Christ in Communion, the more of him dwells within you. I think that too often we approach God with functionality, e.g “we ought to pray”, rather than as a Father “I just want to be with you”… Yet when we are with him we are changed and the world notices. “They realised that they (Peter, James and John) were ordinary unskilled men who had been with Jesus”. When we worship we realise that it is less about technique, or style and more about God’s love overflowing from us. I believe that the “when Harry met Sally” quote “I want what she’s having” ought to be something that happens more regularly, that Christ is seen in us, not just that we have clever words, we have beautiful flyers or we inviting them to a great event. If you were going on a long journey or doing something important most of us would charge up our mobile phone (if we had one) just as when we go out on mission (which is actually what any of us do the moment we walk out of our front door, or into work, or the kids playground) we can’t go out on empty, on drained and with the dreggs of God’s presence. This doesn’t mean you have to turn up at Church all the time, it could just be encountering and worshipping God with CD in your car, or just taking some time out on a park bench before leaping into whatever situation. My suggestion is that we need to be intentional about worship. Worship not just when you feel like it, but actually probably more worthwhile when you don’t feel like worshipping that’s probably when you need to do it the most. Work out times and places that will feed your soul with encountering Christ, engaging with the Father, rather than praying out of a understanding of its importance functionally. God knows we need him, he loves to hear from us, but so often our prayer and our worship is often as a ‘warm up’ to doing something or for a sermon rather than simply because he is a good good father who loves you. Sometimes I think we should stop all Churchy work, and just take time just to encounter Christ again, pursue his presence. The key to it all is the presence of Christ, at times his presence has convicted and converted people without any words uttered, we carry the presence of God, but too often this wonderful light gets hidden under bushels. I love the image of overflow, when we encounter Christ, the overflow of his presences in his people, splashes out to a hungry and thirsty world, who seem him in his people and the thirsty world is drawn to the one who quenches our deepest thirsts and satisfies our deepest hungers.